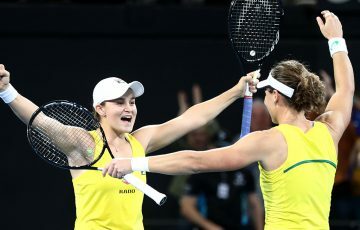 Australian duo Casey Dellacqua and Ashleigh Barty have marched into a doubles Grand Slam quarterfinal today after a 7-6(3) 6-3 victory over fourteenth seeds Natalie Grandin from South Africa and Czech Vladimira Uhlirova. 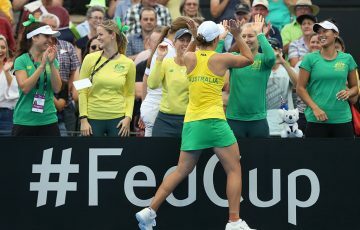 Despite a few hiccups towards the end of the first set, the pair was in control of their own destiny for most of the match but afterwards, admitted to having struggled a little with their own high expectations. The swirling breeze out on Margaret Court Arena didn’t help matters either. “We remained calm enough to get through those issues and win though and that’s all that matters in the end. It’s clear to everyone that watches them play that the pair enjoys each other’s company, but they each have a great deal of respect for what the other brings to the table as well. “And I’ll take the Grand Slam champion,” Barty responded with a grin. The strike rate since then has been almost perfect, with only one loss in three tournaments to date – and even holding match point in that one. “We just go out and have fun,” said Barty. “She knows the doubles court. She makes her returns, makes her serves, and does all the basic things well. In fact, there is over ten years between them, but both see that as a real advantage. “Casey’s had so much experience,” said Barty. “So when the time comes, she can calm me down, and at other times, I can just say ‘let’s have a bit of fun here and give it a rip’’’. For now, the focus turns to their next match. 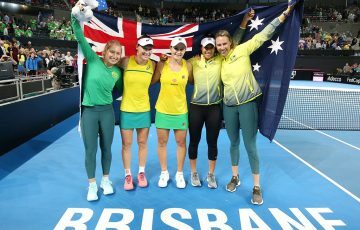 “To be here in the quarterfinals is just unreal,” said Barty. The pair faces Russian Anastasia Pavlyuchenkova and Czech Lucie Safarova on Tuesday. In other Australian news, the weekend saw losses to veteran Paul Hanley, who went down in his third round doubles match with American Eric Butorac to Spanish third seeds Marcel Granollers and Marc Lopez 6-2 7-5. Hanley was also unlucky in his first round mixed doubles affair where he teamed with Zimbabwean Cara Black to bow out to fourth seeds Max Mirnyi and Liezel Huber 6-3 6-2. Anastasia Rodionova didn’t have a happy weekend either, losing to fifth seeds Mahesh Bhupati and Nadia Petrova 6-4 6-2 in her opening round of mixed doubles with Frenchman Jean-Julien Rojer before seventh seeds Nuria Llangostera Vives and Jie Zheng defeated her and Cara Black 7-5 6-2 in her third round of doubles. The only other remaining Australians are Matthew Ebden and Jarmila Gajdosova who play second seeds Leander Paes and Elena Vesnina in a second round mixed doubles contest tomorrow night.